When it comes to commercial properties, ProCraft Exteriors is the one to get in touch with for all of your roofing service requirements. With the intention of providing you with a safe and secure roofing system, our commercial roofing company in Lathrop, MO offers professional service for you. Our roofers are local accomplished professionals that are always on hand for your commercial roofing needs. To ensure you get the best roofing system for your concerns, we always work with you to find the resolution and provide lots of options for you to choose from. We are your source for all your commercial roofing solutions because of our extensive list of services from installation to replacement. To get started today, just give us a call at (314) 786-3732 and speak with our commercial roofing company in Lathrop, MO. Flat Roof Repair and Installation Pierces and tears in your flat roofing should be repaired as fast as possible to avoid leaks and other damage. The most popular roof for a commercial structure is a flat roof. Your commercial roofing company should be trained in flat roofing repair and restoration for the best service. Contact our commercial roofing company today at (314) 786-3732 and chat with our professionals for more information or to schedule an appointment. Roof system replacement is a service that many commercial building owners try to prevent needing. This service can be loud, distracting, and quite expensive, making it difficult. There is an alternative, designed to offer you top notch roofing that is economical with fast installation. Issues with your roof may be repaired with a quality roof restoration, constructed especially for your current roofing system and providing additional advantages to prevent further damage. Contact us at (314) 786-3732 for roof restoration and quality commercial roofing services in Lathrop, MO. 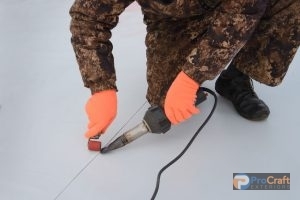 Elastomeric Roof Contractor Choose elastomeric roof coating if you are concerned about possible leaks on your commercial roof. There is a way for you to keep your commercial roofing system healthy and guarantee it remains durable for many years to come in Lathrop, MO. ProCraft Exteriors understands that each commercial property owner has different concerns for the durability of their roof system. No matter what type of roof you have, our commercial roofing company provides a selection of coating options to match your concerns. Industrial Roof Coatings Industrial roof coatings are created expressly to withstand the heavy duty nature of an industrial building while preventing leaks. 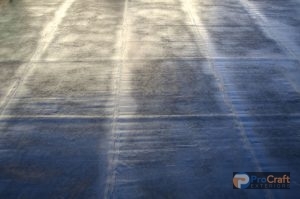 Ready to begin your roof coating application in Lathrop, MO? Contact our commercial roofing company for service from our talented roofers when you dial (314) 786-3732. When it is time for a new commercial roofing system or replacement, you will find you have many choices available for your system. PVC, TPO, and EPDM roofing system membranes provide quality defense for commercial buildings, and that is what we install at ProCraft Exteriors. You can anticipate top notch advantages for your commercial property, such as waterproofing, increased energy efficiency and flexibility, from all of these materials with added individual advantages. EPDM is known for its durability, while PVC is the best option for environmental factor damage defense for commercial properties. 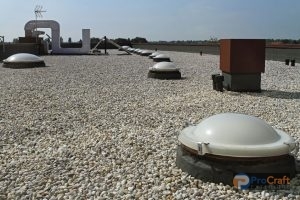 The energy efficiency offered by TPO roofing may help reduce your electric bills. Not sure which is best for you? Our roofers can assist you in finding the optimal choice when you contact us. Roof coating can be applied to the roof to help enhance your systems defenses. 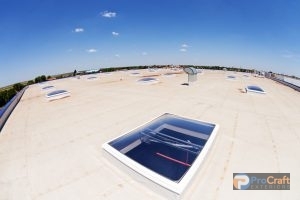 Our options include foam roofing and elastomeric, acrylic, and silicone roof coatings. These applications can increase energy efficiency, waterproofing, fix damage, and more. All of our commercial roofing projects gets the best products and installation techniques from our skilled commercial roofing company. Let’s start today. Give us a call at (314) 786-3732 for more commercial roofing material information in Lathrop, MO.